Patients and Methods: Five patients (3 females and 2 males, mean age 38.8 yrs, range: 30-56) having favorable body habitus (mean BMI 23.4, range: 18-30) underwent robotic-assisted thyroidectomy through a gasless transaxillary approach. All procedures were performed with the da Vinci S surgical robot system using four robotic arms that handled a 12-mm telescope and three 8-mm instruments. 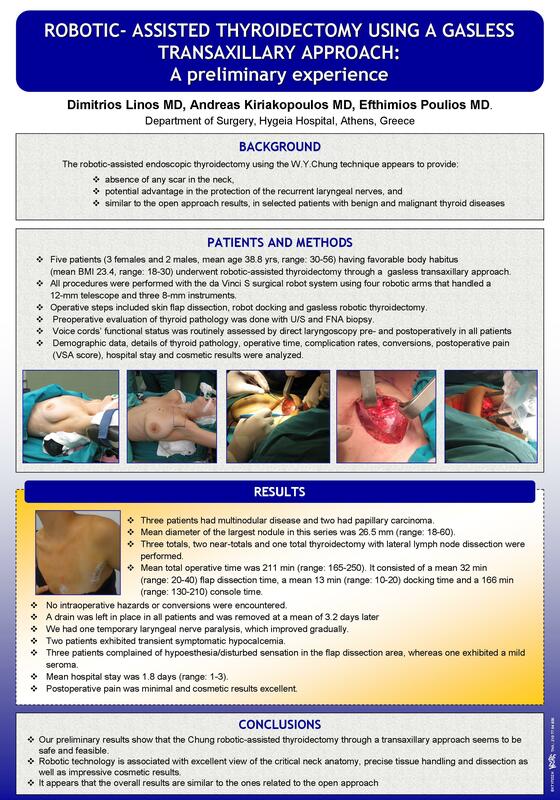 Operative steps included skin flap dissection, robot docking and gasless robotic thyroidectomy. Preoperative evaluation of thyroid pathology was done with U/S and FNA biopsy. Voice cords’ functional status was routinely assessed by direct laryngoscopy pre- and postoperatively in all patients. Demographic data, details of thyroid pathology, operative time, complication rates, conversions, postoperative pain (VSA score), hospital stay and cosmetic results were all analyzed. Results: Three patients had multinodular disease and two had papillary carcinoma. Mean diameter of the largest nodule in this series was 26.5 mm (range: 18-60). Three totals, two near-totals and one total thyroidectomy with lateral lymph node dissection were performed. Mean total operative time was 211 min (range: 165-250). It consisted of a mean 32 min (range: 20-40) flap dissection time, a mean 13 min (range: 10-20) docking time and a 166 min (range: 130-210) console time. No intraoperative hazards or conversions were encountered. A drain was left in place in all patients and was removed at a mean of 3.2 days later. We had one temporary laryngeal nerve paralysis, which improved gradually. Two patients exhibited transient symptomatic hypocalcemia. Three patients complained of hypoesthesia/disturbed sensation in the flap dissection area, whereas one exhibited a mild seroma. Mean hospital stay was 1.8 days (range: 1-3). Postoperative pain was minimal and cosmetic results excellent. Conclusions: Our preliminary results show that the Chung robotic-assisted thyroidectomy through a transaxillary approach seems to be safe and feasible. Robotic technology is associated with excellent view of the critical neck anatomy, precise tissue handling and dissection as well as impressive cosmetic results. It appears that the overall long term results are similar to the ones related to the open approach.